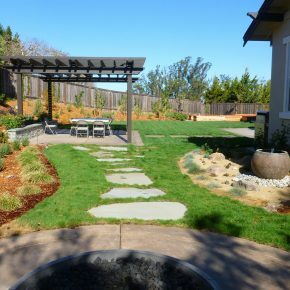 This project in Petaluma by Helen Putnam Park was fun transformation of an existing large lot landscape. 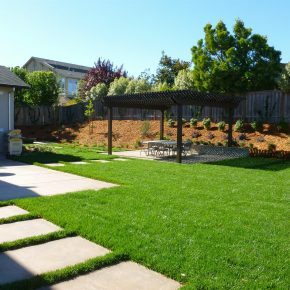 The homeowners had purchased the home new about 10 years ago, but the existing landscape was showing its age and didn’t fit their needs. We were brought in to look at the project with an existing landscape designers plans. While the plans were nicely detailed, they were too elaborate to be built to a reasonable budget. We worked with the client to develop a scaled back plan, which leveraged many of the initial design ideas, but in a way that was simpler and more elegant, while reducing cost. 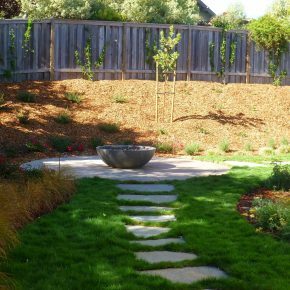 The design featured several elements including large concrete patios and stepping stones, grass area, vegetable garden and shade pergola and seat well. 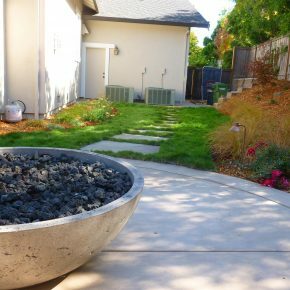 Accents of zonable low voltage lighting, succulent garden with fountain, and firepit area filled out the design. We also regraded the property to level and better use the large lot footprint. The result was a nicely transformed and more usable space. If we had to pick one word to describe O’Connell Landscaping, it would be EXCEPTIONAL. We met Michael O’Connell when we were putting a design to bid from a different landscape designer. In working up the bid, Michael realized that the work as envisioned by the original designer could not possibly be completed within our budget. Rather than just submitting the bid like the other contractors, he took the extra step to tell us that he’d be happy to work with us on a new design that would better suit our needs and budgets. Thus, began our wonderful experience with Michael and O’Connell Landscaping. During the design phase of the project, Michael broke down every element of the original plan and quickly guided us through a decision-making process to prioritize what was important to us, what types of materials would work for us, and how those choices impacted our budget. I was amazed at how quickly Michael was able to narrow down the often-dizzying array of options and through a series of questionnaires and design reviews lead us to a final plan that included ALL of the major design elements from our original plan at a price that met our budget. The construction phase of the project was equally efficient and enjoyable. The O’Connell construction crew was wonderful—very respectful of our property, our neighbors, and our family—and completed the project on-time and on budget. Ruben, the lead on the project and a master at the art of using a Bobcat, has been with O’Connell for more than 30 years, a further testament to the quality business Michael O’Connell operates. 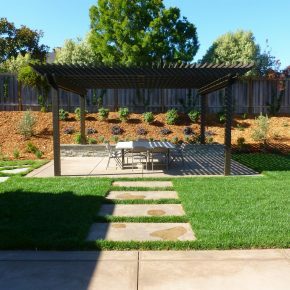 Both Ruben’s and Ubaldo’s experience and skill definitely showed through in our finished project—expertly framed pergolas, beautifully crafted seat walls, exceptionally constructed fences and gates. 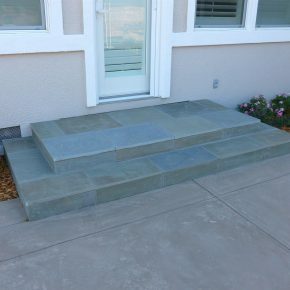 Michael’s choice of sub-contractors was equally exceptional, with three colored-concrete patios that have literally caused our guests to gasp at their quality. Michael was frequently on-site during the course of our 20-week project, reviewing progress, answering questions, and otherwise making us feel that we were his company’s top priority. 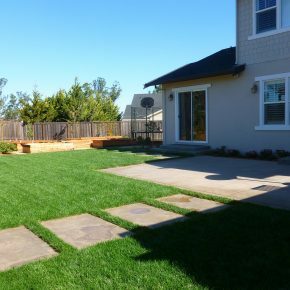 To say that the finished product exceeded our wildest hopes would be an understatement—an absolutely remarkable transformation of our backyard and an absolutely wonderful experience with O’Connell Landscaping. We couldn’t recommend his company more strongly.